Well, this is certainly unlike anything I’ve ever played. 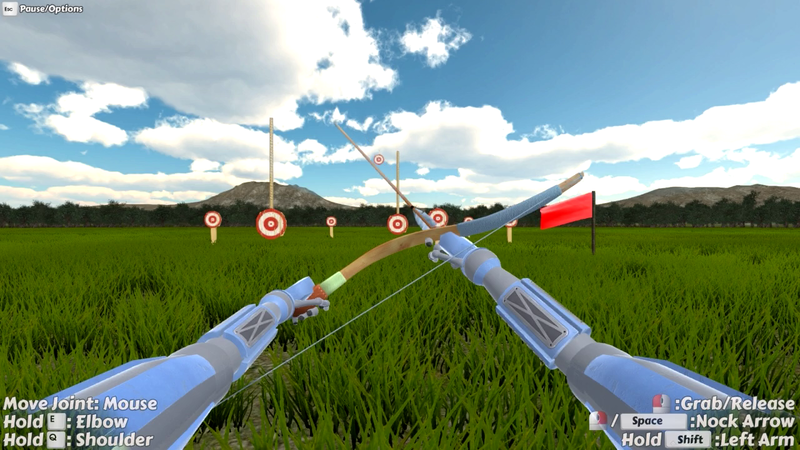 Think QWOP and Surgeon Simulator, but with archery and an extreme increase in difficulty. 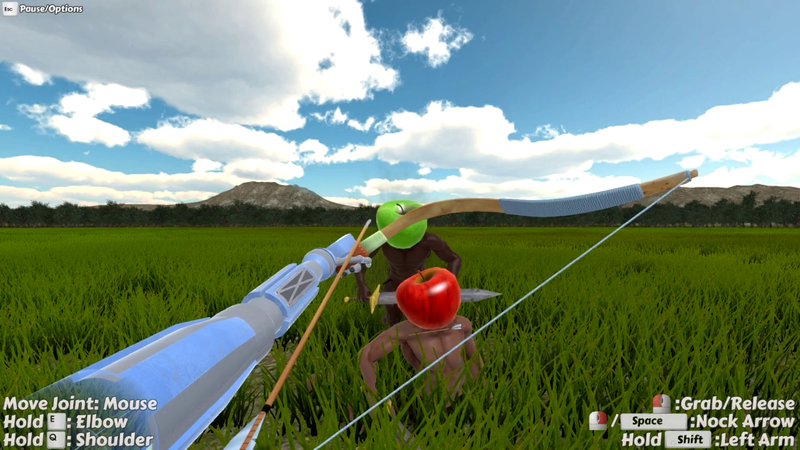 Probably Archery is one of the most difficult games I’ve ever played, ever. In my life. I can’t even play the game properly. I cannot fire an accurate shot to save my life. I spent a good while in the target practice mode and not once did I hit any of the targets. I had some luck in another mode, where there were these apple-headed humans running towards me with swords. I would fire my arrow just as they were in front of me. That worked up until the game sent two of these guys at me simultaneously, then I failed, just like I did in every other mode. Both hands need to be manipulated in order to fire an arrow. The left hand wields the bow, while the right wields an arrow. There’s several different methods to adjusting your aim, but good luck getting anywhere with it. It takes some serious skill to be anywhere near good. There’s plenty of modes to try out, even a multiplayer zombie soccer mode, which I was not able to play due to lack of players online. There’s actually a few multiplayer modes, including team deathmatch and a co-op wave-based ‘horde’ mode (all of which I was unable to try). I had the most fun with the target practice mode though. So many objects to hit, yet I missed every single shot. I was amused at my abysmal performance. I’ll probably never be good at the game anytime soon. Probably Archery does support gamepads, so maybe I would have had more luck there, but the game is fun nonetheless.